Unless the album is brand new, clean vinyl record covers are a rare site. Used albums usually have one problem or another: seam splits, cut corners, ring wear or worse. Some of these things are relatively easy to fix and cleaning up your jackets to remove the accumulated dust, grime or mildew from long-term storage isn’t that hard. Two inexpensive items and about ten minutes or less and your jackets can look new once again. Different techniques are out there, some including water or cleaning products but I prefer to avoid introducing liquid cleaning agents into the process. Instead, keep a Staedtler Mars Plastic Eraser and an Alvin Drafting Dry Cleaning Pad on hand. Both of these are leftover remnants of art school and they have found new uses in cleaning things over the years aside from erasing marks on paper and grime from my lp jackets. Who knew they’d fine a use among collectors? Grab a pack of any brand but be sure to go with a scent/dye free brand. For extreme cases, I will wring one of these out or dilute the cloth with a quick water bath and then wring it out. As a final step, these can help remove more stubborn grime and dirt but be extra careful when introducing any type of liquid onto a paper substrate because those two usually don’t mix well. Do not use any liquid cleaning solutions on uncoated jackets. Nothing is foolproof here and some jackets are beyond rehabilitation so just wait to find a better one while shopping and switch it out later instead of putting too much effort into cleaning. Also, the process that I describe below can damage some paper products, mostly in the form of ghosting, the smearing or discoloration of the paper that is caused by the friction of rubber erasers. Be especially careful with jackets that feel uncoated, not laminated, not glossy, they feel just like a printed sheet of paper. These are the most troublesome and have a tendency to look like a hand written term paper covered with erasures if handled too aggressively with cleaning products. Before committing to any cleaning technique, always try a product in a small, inconspicuous area to make sure no damage or unexpected interactions between a cover and cleaning product occur. If all is well, begin with the plastic eraser and gently erase areas of the jacket that are dirty. Don’t be too aggressive; just be firm enough to lift away the layers of grime. Results should be practically instant but break every minute or two to clean away loose eraser shavings and inspect your progress. Not every cover will clean up perfectly, but a majority of dirt and grime should be lifted away without much effort. For gentler cleaning, the dry cleaning pad comes in handy. The mesh bag will release eraser particulate when gently tapped or rubbed on any surface and the action of rubbing will work in similar fashion to the plastic eraser. 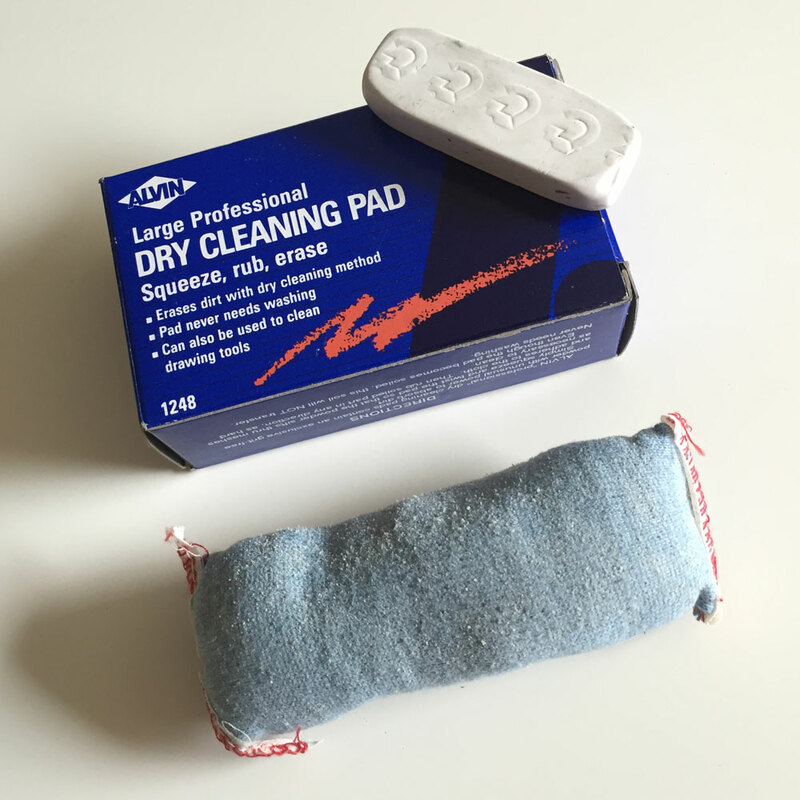 This technique can be useful for large areas of cleaning or on jackets that are too delicate for a plastic eraser.